You may now be aware of the upcoming changes to the classification and labelling of cleaning products as the majority of States in Australia transition to the Globally Harmonized System for the Classification and Labelling of Chemicals (GHS), which becomes mandatory in most states from 1st January 2017. 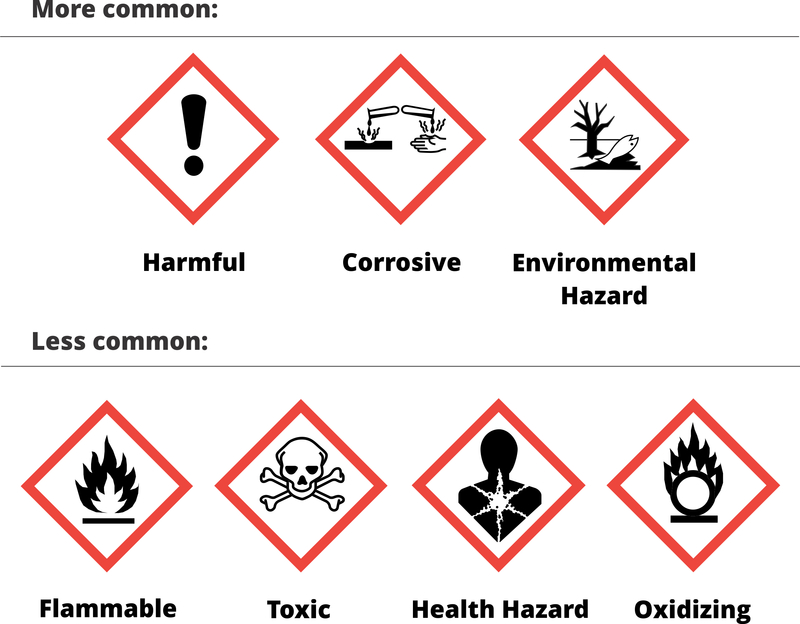 The GHS is an international system, designed to unify the classification and communication of chemical hazards throughout the world using new hazard assessment criteria, and consistent information and pictograms on product labels and safety data sheets (SDS). The system only applies to chemicals used in the workplace and does not include those sold to the domestic market. As it stands all states in Australia, excluding Western Australia, ACT and Victoria, will be transitioning to the GHS at the beginning of next year. Victoria is likely to transition on 1st July 2017. Agar Cleaning Systems has been working tirelessly to implement the GHS changes to ensure its clients are ready well before the January deadline. By partnering with Agar, customers have always been safe in the knowledge that they are compliant in chemical management. Agar will endeavour to assist all customers with their transition to the new system by providing relevant technical support and information. Below are the main changes to be aware of with the inception of GHS. Firstly, the system will reclassify which chemicals are deemed as hazardous under stricter criteria. This means that the majority of commercial cleaning products will now be classified as hazardous including the likes of hair shampoo and manual dishwashing liquid. Please note that the products are staying the same: it’s only the hazard criteria that is changing. Under the new rules for classification, minor hazards which were not recognised under previous regulations, will now be identified. An example of this would be repeatedly using a detergent, currently classed non-hazardous, with a sponge whilst not wearing gloves. This is not healthy for the skin and can lead to dryness and further issues. This is not recognised under the existing rules because the detergent is not currently classified as hazardous. GHS recognises the risk to the skin in this situation, considers it a hazard, and will require a warning. The situation however is easily dealt with by wearing gloves, which the cleaning staff are likely to already be doing. The implication of this is that virtually all chemicals will require a risk assessment to be completed before use and a record kept on site. Under the GHS, hazards and precautions will be communicated on SDSs and labels using Signal Words, Hazard Statements and Precautionary Statements. Pictograms will be used to visually communicate hazards on labels and SDSs. Examples of the pictograms that will be found on some of Agar’s labels are supplied below. Please note not all hazardous products require a pictogram. Those that are deemed mild enough can be labelled without them. Found on product labels and SDSs, each hazardous product will now be classified under one of the two signal words: Warning and Danger. Warning will categorise the lower risk and Danger the higher. The Hazard Statement details the nature of the chemical’s hazard and its degree of severity. Hazards include those that affect health, physical safety and the environment. Examples include: ‘causes mild skin irritation’ and ‘causes serious eye irritation’. Precautionary statements are found below Hazard Statements on the SDS and include four headings: Prevention, Response, Storage and Disposal. ‘Prevention’, which outlines measures to take to reduce the risk of the hazard and ‘Response’, which refers to first aid advice, will be found on every SDS. ‘Storage’ and ‘Disposal’ information will only be found on products where this information is required. 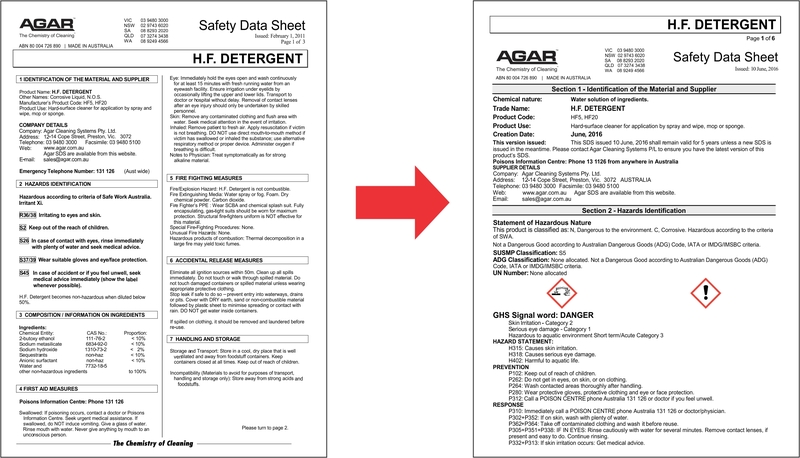 With the introduction of GHS, the majority of Agar’s product labels will change to include the hazard/precautionary information and pictograms. Agar is currently in the process of updating all its labels and is on track to have these released well in advance of 1st January 2017. Please note that Safe Work Australia released a statement in November allowing products manufactured prior to GHS inception to continue to be sold with labels applicable to their time of manufacturing. All new products manufactured after 1st January 2017 must be sold with GHS labels. Dispenser bottles will also be updated to reflect the changes. It is important to note that end user clients do not need to replace labels or throw out dispenser bottles carrying the old information. The GHS SDSs will include new pictograms, signal words, hazard statements and precautionary statements, and will see Agar’s SDSs expand from its standard two pages to five-six pages. All of Agar’s GHS SDSs can be found here https://agar.com.au/sds/. Agar would like to thank all its valued clients with for their patience during this process. For further information on Agar’s transition to GHS, please contact your local Agar office.